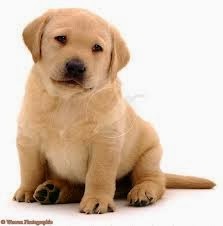 Labradors come in three “varieties”: yellow, black, and chocolate. Eyes are usually a warm hazel or brown with dark rims, and the nose black or dark brown, although a yellow dog’s nose may fade to pink in winter. The coat is dense and waterproof, and curiously its color can have some bearing on personality. Mating between yellow Labradors always produce yellow offspring. Black Labradors, however, may bear either all black puppies or a mixed litter. Professional breeders usually know whether their black stock carries the potential to produce yellow. Vets and breeders generally find no differences between yellows and blacks in characteristics such as trainability, playfulness with other dogs, or enjoyment at being petted. However, yellow Labradors are considered slightly more likely to whine for attention, and to bark when anxious or to protect the home. They may also be moderately more excitable, and more destructive when left alone, although all these behavior variations are very minor. Color intensity ranges from champagne cream through rich golden, to the more unusual fox-red. The black Labrador has a typically strong yet gentle face with noble features. This rich, attractive coat color is relatively rare, but becoming increasingly popular. Both yellow and black Labradors may produce chocolate-colored puppies, but the genetics are complicate. In theory, all three colors can appear in one litter – and occasionally this does happen. However, when matters are left to nature alone, just one puppy in eight is born with chocolate pigmentation. Breeders normally prefer to avoid using yellow stock to produce chocolate offspring, as these puppies sometimes have very pale skin and light eyes. A breed that revels in getting wet if water is available – from the smallest of puddles to a vast ocean, no matter how dirty or salty – Labradors will find it, and dive in with relish. The breed’s powerful muscular legs, well proportioned chest, and webbed toes are perfectly designed for speed and endurance when swimming. The Labrador Retriever has inherited a thick, wooly undercoat from its Canadian ancestors, bred for work in the cold waters of Newfoundland. This specially-adapted layers gives superb, waterproof insulation, although Labradors can still suffer from hypothermia in severe conditions.